AURORA, OH: Network Technologies Inc (NTI) announces the addition of the SPLITMUX® Low-Cost HDMI Quad Screen Splitter/Multiviewer/Extender to its popular line of multiviewer products. The unit enables real-time 1080p video from four sources to be simultaneously displayed on a single HD display, which can be extended up to 250 feet away. The SPLITMUX-C5HDR-4LC supports HDTV resolutions to 1080p and computer resolutions to 1920x1200. The audio/video output can be extended up to 250 feet away via a single CAT6/6a/7 cable. Available display modes include: Quad, Picture in Picture (PiP), and Full Screen. The unit features fluid, real-time video performance with 60 frames per second in all four quadrants when in Quad mode. 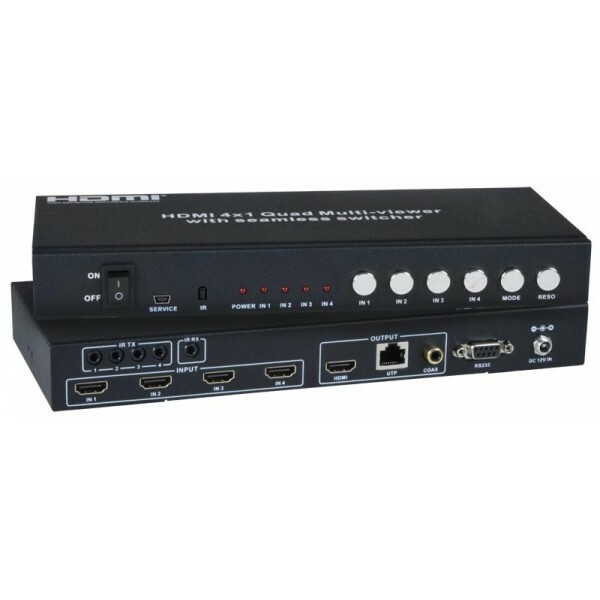 HDMI features include 24-, 30-, and 36-bit xvYCC, sRGB, and YCbCr inputs; 24- and 30-bit sRGB outputs; four-channel non-mixing stereo with 16-, 20-, or 24-bit uncompressed PCM audio; bandwidth up to 165 MHz. The multiviewer is controlled via the front panel interface, IR remote, or Graphical User Interface (GUI) via RS232. The SPLITMUX-C5HDR-4LC can be cascaded to display video from any number of sources with any number of slave levels on a single screen. Output video has adjustable brightness, contrast, color, and sharpness. The multiviewer and included remote unit supports simultaneous local and remote HDMI output, with coax SPDIF audio outputs at both ends. The remote unit also comes with ARC (Audio Return Channel) support, which can be used to switch connected speakers between audio output from the multiviewer and HDTV TV. Any DVI source or display can be connected to the multiviewer using a DVI to HDMI cable. Compatible DVI/Composite/VGA + Audio to HDMI converters pass various video and audio signals to the multiviewer. The SPLITMUX-C5HDR-4LC is compatible with the HDMI Quad Screen Multiviewer (SPLITMUX-HD-4RT) for cascade configurations, enabling set-ups that fit each user's parameters. Available for immediate sale, the Low-Cost HDMI Quad Screen Splitter/Multiviewer/Extender costs $840. Network Technologies Inc (NTI), established in 1984, is a leading manufacturer of high quality IT and A/V solutions. NTI products (environment monitoring systems, multiviewers, extenders via CAT5, audio/video matrix switches, and KVM switches) are designed, manufactured and tested at the company headquarters in Aurora, Ohio, and are backed by a two-year warranty on all parts and labor. NTI products are used worldwide by leading companies in every industry, including manufacturing, retail, government, education, healthcare, financial services, entertainment, worship, broadcast, and telecommunications. NTI is dedicated to delivering solutions that are of exceptional quality, reliable performance and innovative technology. For more information, visit www.networktechinc.com.